Plymouth University’s marine research expertise has been recognised by two major grants from a prestigious national funding body. 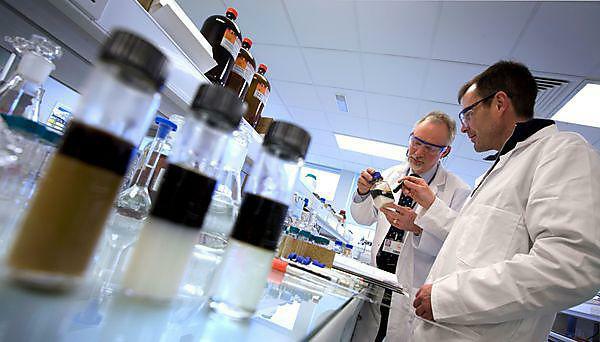 The University was awarded £368,060 from the Natural Environment Research Council (NERC) across two separate bids relating to advanced analysis of complex chemicals, and the development of new technologies to map the seabed. The awards were made from NERC’s Strategic Environmental Science Capital Call, for which only one in three applications were successful. And the University’s success was part of a wider good-news story for the city, with Plymouth Marine Laboratory (PML), the Sir Alister Hardy Foundation for Ocean Science (SAFOS), and the Marine Biological Association (MBA) all receiving one award each, bringing the total grant awarded to Plymouth’s marine sciences centres to £1,436,155. Of the two grants, £225,000 was awarded to the School of Geography, Earth and Environmental Sciences to take forward work led by Professor Steve Rowland in the field of biological and geochemical sciences, in particular the measurement and identification of organic chemicals. The money will enable the team to obtain an ‘Ultra High Performance Liquid Chromatograph - Time of Flight - Mass Spectrometer’, which will be used, for among other things, joint research projects with other universities. The new equipment will further add to the capability of Professor Rowland’s team, who for the past 30 years have established a world-leading reputation for the way they have been able to identify complex mixtures of marine chemicals. This was most recently demonstrated when they analysed the substance that was responsible for killing thousands of seabirds along the South Coast last year, and discovered that it was an industrial lubricant used by cargo vessels, findings that led to changes to maritime law. The second grant, totalling £143,060, was made to the School of Marine Science and Engineering for a seabed sampling project led by Associate Professor Kerry Howell. This will fund the purchase of new equipment, including an advanced winch and video cabling, that will enable cost-effective visual surveying of the seabed in water at depths of around 50-100m. Again, this award builds on a legacy of innovative research by Dr Howell and colleagues, which has included the mapping of significant areas of the Atlantic, and the discovery of habitats such as cold-water coral reefs. The award of £495,000 to PML, £396,096 to SAHFOS, and £177,000 to the MBA, meant that Plymouth institutions secured one sixth of all the awards, and just under a fifth of the total fund. It demonstrates again the scale and level of expertise of the world-class marine researcher community that is based in Plymouth.